The end of the year can be a reflection period, seeing how much (or little) you have in the bank, the balance carried on a credit card, and thinking of the needed home improvements that you need to save for. 2017 will be a good time to focus on the important spending, and a few money-saving tips may be able to help. For those that do not cook, this may be a tough one, but for anyone that are able to prepare meals, if you start eating at home you will start to see the savings almost immediately. For a couple to spend $50 on a meal, with tip, out is pretty easy to do, let alone a family of four, so when you think of how many groceries you can buy to for that much, eating at home little a little better. 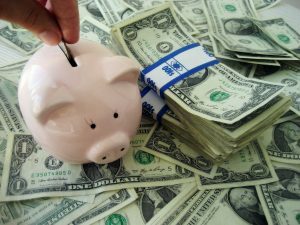 The goal would be to have money leftover at the end of the month, so if you are spending every available dollar that you have, let alone putting on a credit card and worrying about it later, the debt will start to pile up. Carrying over debt each month means wasting money on interest and seeing little of the principal balance decreasing. You know how much money comes in each month, so try and live within your means. This is tough, as most Americans actually fail at a budget, so be the minority that can create and follow a successful budget. Take note of all money coming in, and going out. Allocate sufficient funds for the necessities such as bills, food, and gas, limited spending, while contributing to savings accounts. It can sound easier said than done, but if you review your entire bank or credit card statement, circle the items that could have been avoided and you may be in for a surprise at how much you could have saved. If you are out and having a few drinks, pretty soon the night goes on and you are having fun, and money begins to be less of a priority the more you drink. It may be a good idea to shut it down and head home at midnight, because this is when the rounds of shots are bought or if at the casino, another trip to the ATM could mean more money lost. Careless spending will hurt your account balance, and make you feel bad in the morning. Sure, we all want top of the line products: a new car, top of the line TV, high-end clothes, but the truth is, as you get older, no one cares, and no one can tell, so there is no point to striving to hit a certain status. Appreciate the items that you have, and when there is a needed upgrade, pick and choose the premium products to purchase. A nice Samsung TV will be worth the extra money, but there is nothing wrong with buying your clothes from Target.